My mum and I always talk about how we need to get away more together, but with both of us leading such busy lives it remains just that, talk. So you can imagine my sheer delight when Joules invited us both to a special Mother's Day trip to Watergate Bay Hotel, in Cornwall. I immediately rang my mum and told her WE ARE GOING. This isn't the easiest for my mum as she helps take care of my nan who has vascular dementia, but I knew she needed this trip, the chance to relax, and I also knew we needed this time together. So with family and friends stepping in to help with my nan and the boys we were finally getting our little trip away together. 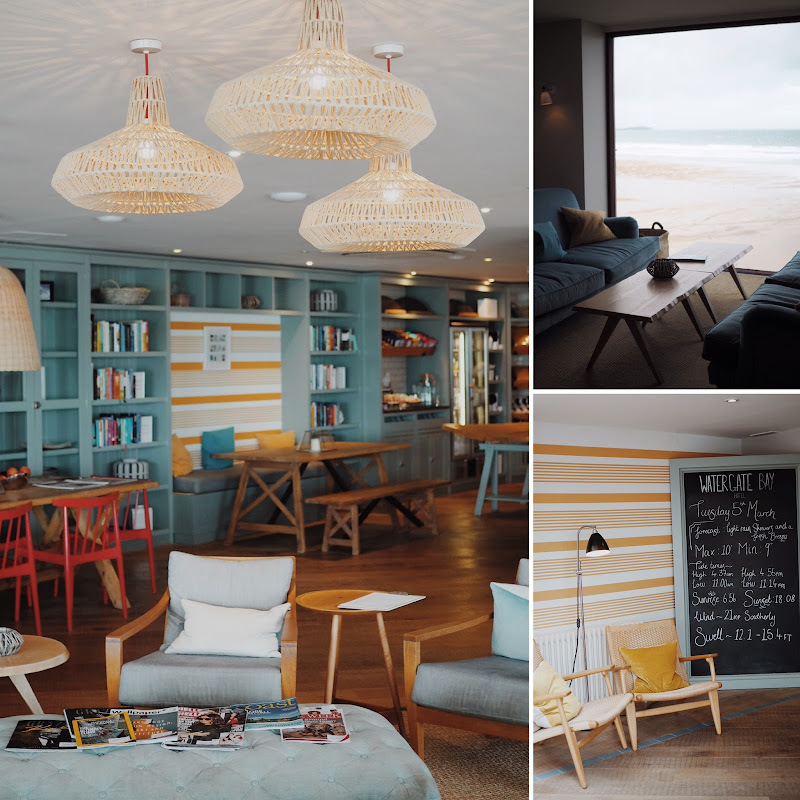 Having never been to Cornwall I was excited to see this beautiful part of the country for myself, and I was equally excited to be staying at Joules partner hotel, Watergate Bay. I've heard so many wonderful things about this hotel, especially the views, and for me you can't beat a hotel with a good view. As soon as you walk into Watergate Bay it has every mark of a four star hotel but yet I love how relaxed and chilled it feels. It's not pretentious in the slightest, it's all warm smiles, hellos and instantly making you feel at home. The decor is stunning too, think luxury beach house vibes and you're there. From the offset it's very clear why Joules and Watergate Bay make such good partners, they very much share the same ethos, laid back luxury with gorgeous attention to detail. The wonderful Joules team were also there to greet us on arrival too and introduce us to the other guests on the trip, some of which I've been friends with online for years now, Laura-Ann, Cara, Sally and Sarah-Rose. I knew instantly this was going to be a good group and I was so looking forward to getting to know these ladies more in the flesh. Once we were checked in it was time to go up to our room to unpack and quickly freshen up before lunch. Our room was beautiful, made even more so by Joules. 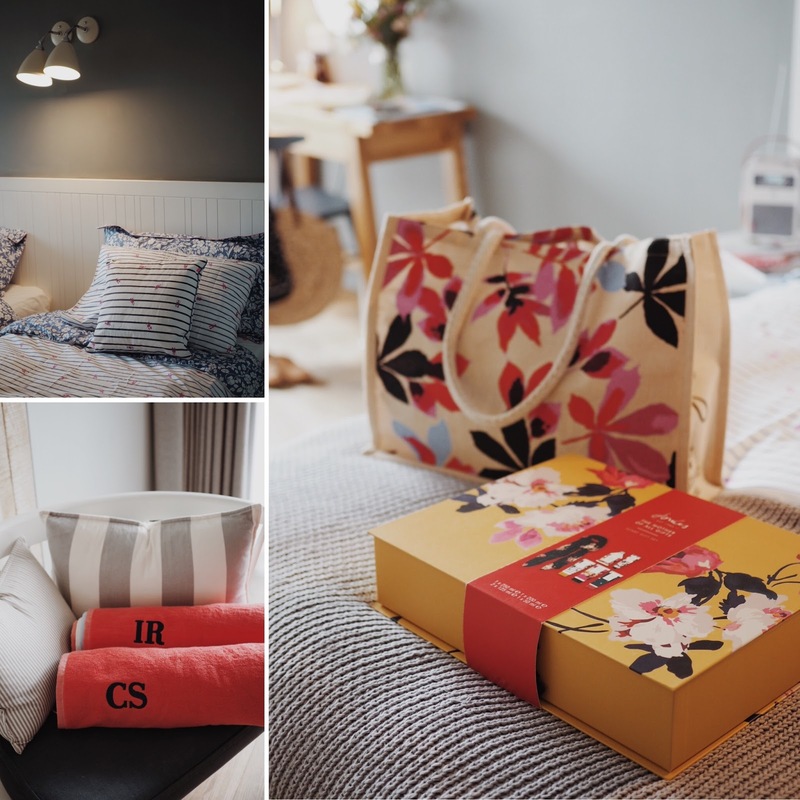 Prior to our trip Joules asked us to choose some of our favourite pieces from their Spring/Summer Collection, all of which were waiting for us in our room along with other gorgeous goodies. My mum and I felt entirely spoilt and I'm pretty sure we let out a squeal when we realised our room had a sea view. This is what I like to call embracing the British weather! What a giggle we had as the wind howled and the rain battered down. No sun on your next beach holiday? I say grab your wellies, your raincoat, oh and a costume, definitely a costume, and get yourself on that beach! Soaked through and laughing it was time to warm up inside. I thought weather like this could totally put a damper on a trip away to Cornwall, but Watergate Bay is the perfect hotel to take shelter from the storm. With it's amazing views from the pool and spa area, you can relax and watch the storm roll in. One of the absolute highlights of this trip was watching my mum relax. The words 'my mum' and 'relax' don't tend to go in the same sentence together. She's always so busy running around doing so much for others, myself included, that I can't help but worry about her. It was so good to see her relax and I felt like I could see the weight visibly lift from her shoulders. 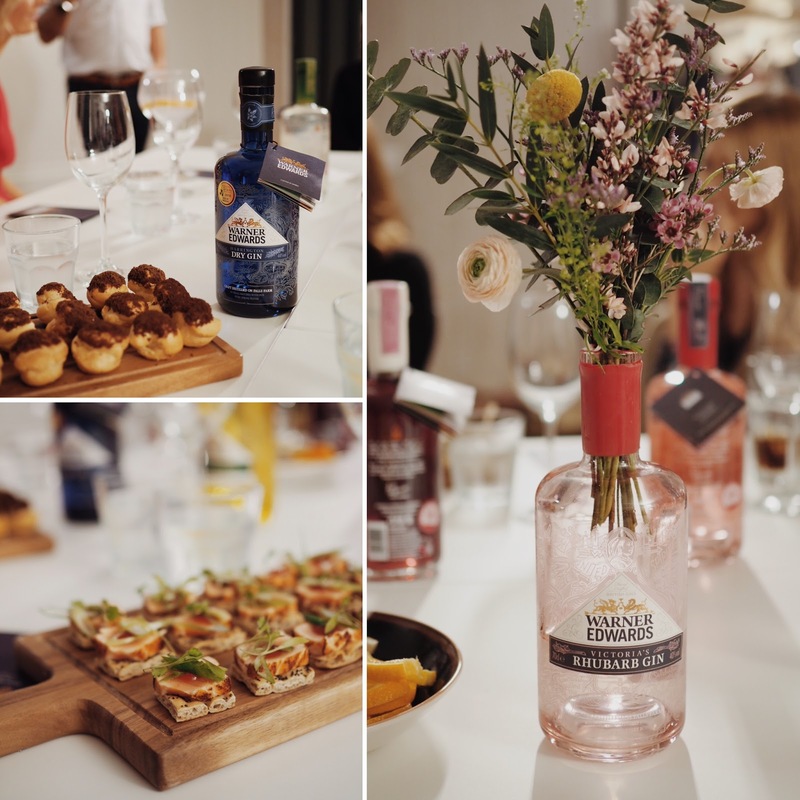 After such a relaxing afternoon it was time to get ready for Gin Tasting with Warner Edwards Gin. Now I love a good gin and tonic but it's my mum who really knows her stuff, so I knew she would love this. The class was kindly hosted by Ross who gave an insight into how Warner Edwards Gin first started. A family farm that wanted to go back to the roots and create fine quality gin, and that they did. We got to sample various flavours in their beautiful distinct coloured bottles and I discovered the wonder of their Honeybee gin, who knew?! We finished the evening with a dinner in Zacrys Restaurant at the hotel, an end to what was an absolutely cracking first day. The next morning after breakfast we were treated to a Flower Pressing Class by the lovely Ellie, from The Flower Press Shop. 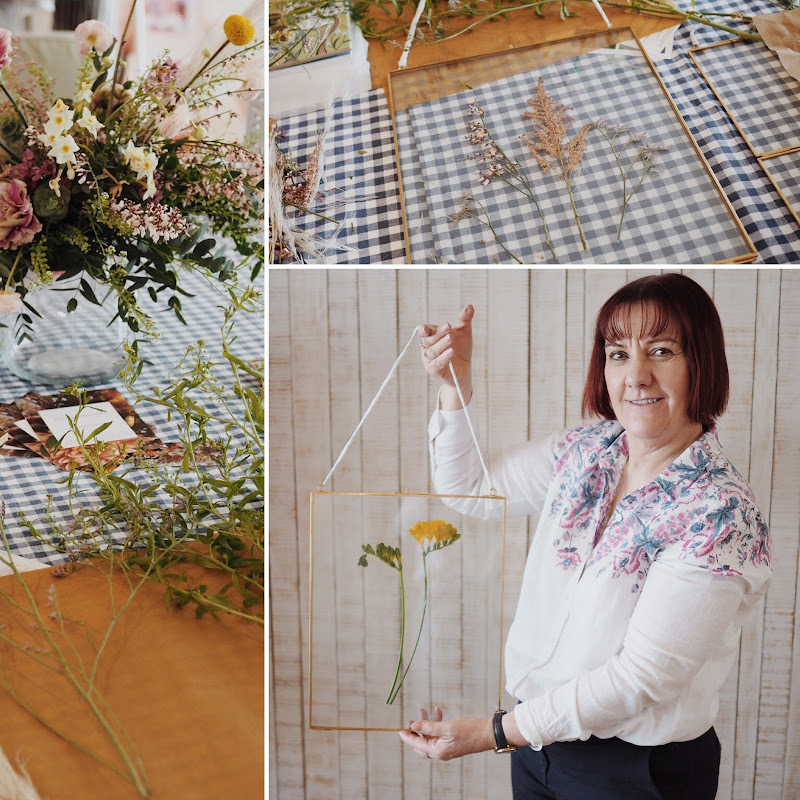 She showed us the simple steps to quickly pressing flowers that can be displayed in glass frames to make your very own decorative floral wall art. I still can't get over how easy this was and I definitely plan to make more. Once you've selected the flowers you want for your frame and cut to the desired length, you place them between the two pieces of greaseproof paper, and then place the hot iron on the top sheet of the greaseproof paper and firmly press down. The thicker the flower the longer it will take to press, the ones I chose only took a few minutes. Also if you choose flowers that tend to hold a lot of moisture you'll need to allow drying time, as the heat from the iron draws out the water in the flower. Once the pressed flowers have cooled down you can pop them into your frame in whatever figuration you like. I love how simple and effective this technique is, and I also love that I now have a wall hanging that will remind me of my time here in Cornwall with my mum. As we pressed flowers the worst of the weather was passing which was perfect timing for our trip to Padstow in the afternoon. I was so excited to see more of Cornwall and Padstow did not disappoint, with it's harbour and winding streets of colourful houses, this place is postcard pretty. Cornwall certainly isn't lacking when it comes to good food, and famous chefs for that matter, and we were lucky enough to have lunch at Paul Ainsworth's restaurant, Rojanos. I would highly recommend, especially the seafood. My mum and I devoured the most delicious prawns. Good food, good wine, good chat, my idea of a perfect lunch. After lunch we headed back to the hotel as both my mum and I had full body massage booked, beyond spoilt! We even braved the hot tub outside afterwards which was interesting getting in and out of in the freezing cold, but totally worth it for the most beautiful view. For our final evening Joules had organised dinner at Jamie Oliver's award winning restaurant Fifteen, which is just a stones throw away from the hotel. 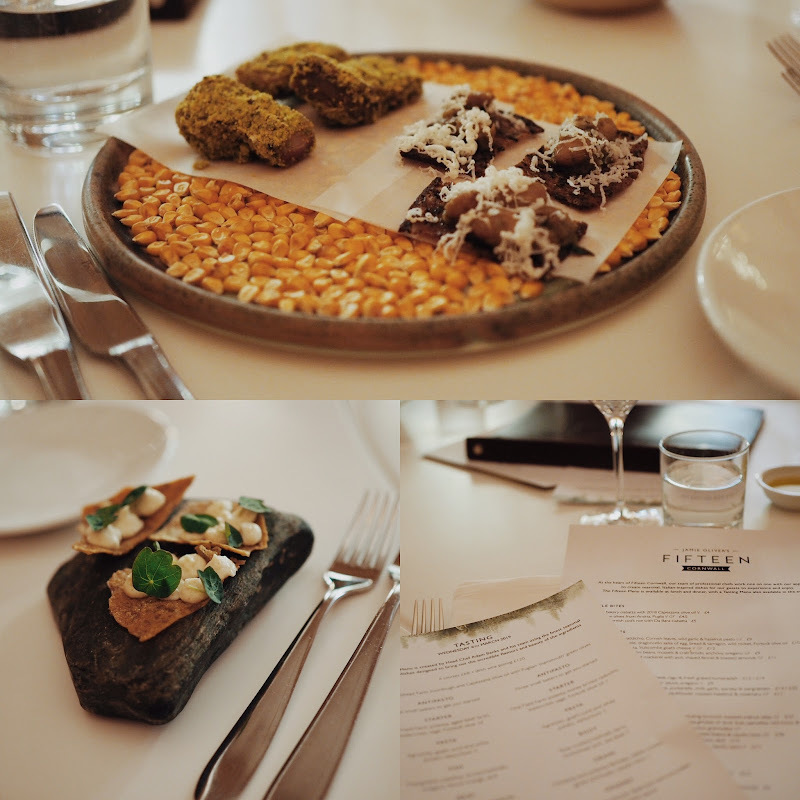 We tried the tasting menu which is a culinary experience in itself, with it's open plan kitchen you see the all the hard work and love that goes into every plate before it is stylishly brought to the table. It was a delight from start to finish! It was such an amazing way to finish up what had been a thoroughly amazing trip. Amazing food, amazing company. It's moments like this that make me feel very lucky to do the job I do, and to also have my mum be a part of it too. I want to say a HUGE thank you Joules and the whole team for giving my mum and I the most amazing experience with this trip. We won't actually get to spend Mother's Day together this year so this has been an incredible treat! If you're looking for inspiration this Mother's Day for a special woman in your life, Joules have lots of lovely ideas HERE too. * For full transparency, this post has been marked AD and was an unpaid press trip. I had full control over what I share and as always all opinions are my own.